The bilingual aeronautical dictionary from Goursau, of worldwide renown, is finally within reach of professionals and students. Over 5,000 technical translations adapted to your activity to be more comfortable in your professional life. The best tool for everybody, created to bring you the essential in a practical format for a price that is more than affordable. Practical, modern, well-adapted it is simply ESSENTIAL ! Henri Goursau est entré en 1997 dans le Livre Guinness des Records. 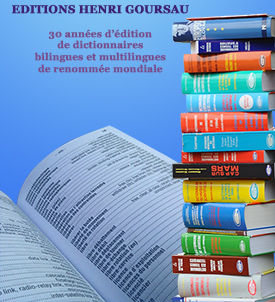 Il détient le record mondial absolu du plus grand nombre de langues contenues dans un dictionnaire! © 2016 Editions GOURSAU. All Rights Reserved.